I recently caught up with a Trekkie friend of mine. He's a psychiatrist and I'm a psychologist, so of course we did a deep dive into the psyche of the latest film — Star Trek Into Darkness. Our conversation kept coming back to Spock. "He's the most important character in the Star Trek universe," Dr. T said. "Spock has wielded more influence on the alpha quadrant than anyone else." I never thought about Spock like that before, but Dr. T was right—he is the only character who's made an appearance in every era of Star Trek including The Original Series, The Next Generation, and J.J. Abrams’s new parallel universe. "Why is Spock such an enduring character?" I asked. "What makes him so unique?" Dr. T and I spent the rest of the night trying to understand Spock. After a small detour debating who would win an “Amok Time” fight — Leonard Nimoy or Zachary Quinto, we eventually decided that Spock's teaches us that the things that make us different, strange, and weird are the same things that make us awesome. This is not only an expansion on my conversation with Dr. T., but an attempt to summarize 47 years of canon and 2 parallel universes into 1 comprehensive conceptualization of a character. I present to you the psychology of Spock — past, present, and future. Who we are is the result of our biology, psychology, and experiences. So let's start our conceptualization of Spock by exploring his unique biology. Spock is half human and half Vulcan. While we can't begin to imagine how the biology of an interspecies human would work, we can extrapolate based on what we've seen in Star Trek and know about science. Spock is genetically diverse, making him more adaptive to new environments and less susceptible to genetic diseases (like his father's dementia). 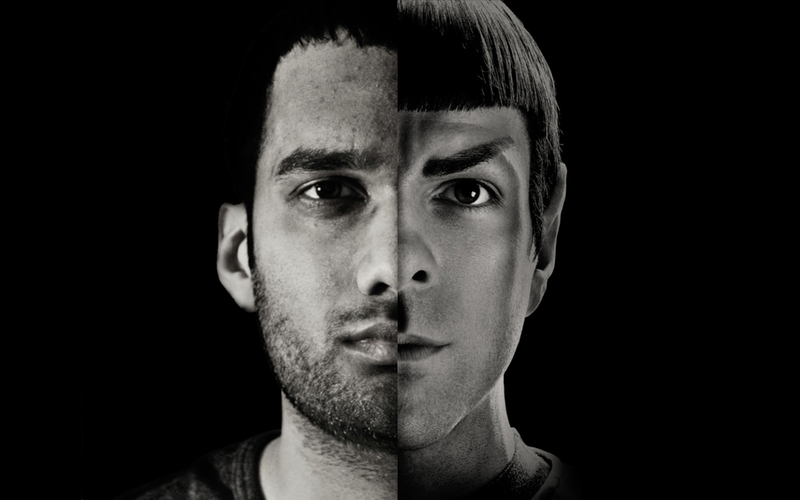 Since Vulcans evolved in a harsher environment, Spock is stronger than humans. Vulcans are touch telepaths, giving Spock the ability to share thoughts through a mind-meld. Vulcans experience powerful emotions, making Spock more vulnerable to very intense feelings. Sarek: "Emotions run deep within our race. In many ways more deeply than in humans. Logic offers a serenity humans seldom experience. The control of feelings so that they do not control you." Soval: We don't know what to do about Humans. Of all the species we've made contact with, yours is the only one we can't define. You have the arrogance of Andorians, the stubborn pride of Tellarites. One moment, you're as driven by your emotions as Klingons, and the next, you confound us by suddenly embracing logic. Forrest: I'm sure those qualities are found in every species. Soval: Not in such confusing abundance. We humans are very flexible in our thinking — which explains why we can be so erratic and unpredictable. This is due to our prefrontal cortex, the region that coordinates our thoughts and decides what to do. It's also the area responsible for regulating our feelings. Because humans can entertain many different ideas at once, sometimes we’re logical while at other times we’re deeply emotional. This is why Spock’s brain is so unique — he's got the flexibility of a human mind combined with the strength of Vulcan emotions. Yes, his human side might make it more difficult for him to control his Vulcan feelings, but the integration of the two gives him the opportunity to quickly think in very creative ways. "A Child of Two Worlds"
The central psychological experience of Spock's childhood is growing up in a bicultural home. Not only is he a minority on Vulcan, he might be the only human/Vulcan child ON THE WHOLE PLANET! The major challenge for bicultural children is to integrate their two cultures. People who are able to do this usually feel proud about being unique. Others find their cultures to be in conflict with each other and feel pressure to choose one over another. Psychologists call this the Bicultural Identity Integration construct. Kids who are able to integrate their cultures become very good at cultural frame-switching — being able to think, act, and feel like a human on Earth and a Vulcan on Vulcan. Kids who can't integrate their cultures don't have this flexibility and have more rigid personalities. This is one of the reasons I love 2009's Star Trek so much—Spock's struggle to figure out his identity is beautifully portrayed. In a pivotal scene, a group of Vulcan boys bully Spock for being half human and push him hoping it will make him mad. Since showing strong emotions is a big taboo in Vulcan culture, this situation created a lot of anxiety for Spock because he was afraid of confirming a stereotype (that he can’t control his emotions). That’s stereotype threat in action—anytime we worry about fulfilling a stereotype we usually preform worse. In Spock's case, stereotype threat contributed to him losing his cool and beating the crap out of a kid (who totally deserved it by the way). Spock: You suggest that I should be completely Vulcan…? Sarek: …Spock, you are fully capable of deciding your own destiny. The question you face is: which path will you choose? This is something only you can decide. Spock: Should I choose to complete the Vulcan discipline of Kolinahr and purge all emotion, I trust you will not feel it reflects judgment on you. Amanda: Oh, Spock. As always, whatever you choose to be, you will have a proud mother. In both conversations we can feel the tension between Spock's Vulcan and human identities. It's clear that Spock was questioning who he is and who he wanted to become (“Should I complete Kolinahr?”). Rather than guiding Spock down one path or another, both of his parents encouraged him to make his own decisions. By allowing him to independently explore his identity they increased the chances of Spock integrating both cultures. This type of parenting is a core component in resilience — the psychological factor that keeps kids healthy despite chronic stressors (like constant discrimination for being a “green-blooded hobgoblin”). "I Choose Not to Feel"
One of the key changes in the new Star Trek parallel universe is the destruction of Vulcan. Not only did Zachary Quinto’s Spock witness this trauma firsthand, he also lost his mother in the process. After this terrorist attack, the Spock of the present was overwhelmed by powerful emotions. In response to his sadness and rage, Spock’s primary strategy became numbing himself to his feelings. After James Kirk ridiculed Spock for "feeling nothing" (another stereotype threat, “Vulcans have no emotions”), Spock attacked Kirk. After almost killing Kirk, Spock gave up his command of the Enterprise because he was "emotionally compromised". Uhura: At that Volcano you didn't give a thought to us, what it would do to me if you died, Spock. You didn't feel anything, you didn't care. Spock: Your suggestion that I do not care about dying is incorrect. A sentient being's optimal chance at maximizing their utility is a long and prosperous life…It is true that I chose not to feel anything upon realizing that my own life was ending. As [REDACTED] was dying I joined with his consciousness and experienced what he felt at the moment of his passing — anger, confusion, loneliness, fear. I had experienced those feelings before, multiplied exponentially on the day my planet was destroyed. Such a feeling is something I choose never to experience again. Nayota, you mistake my choice not to feel as a reflection of my not caring. Well I assure you the truth is precisely the opposite. The Spock of the present meets all major criteria for PTSD — re-experiencing traumatic events, avoiding situations, and becoming very sensitive to certain feelings. This isn't the resilient child we discussed earlier— this Spock is emotionally stuck, much like soldiers and veterans returning from service with PTSD. But this is not the man Spock is destined to be. The Spock of the future (the one played by Leonard Nimoy) isn’t emotionally stuck, he’s incredibly flexible. Unlike most Vulcans, this Spock rejected Kolinahr, deciding to pursue logic and emotions. He integrated both of his cultures, switching his perspective as needed depending upon the situation he’s in. He understood conflicting points of view, making him highly empathic and open-minded. That's why he was so good at negotiating peace between the Klingon Empire and the United Federation of Planets as well as the Vulcan High Command and Romulan Empire. Captain Picard even compared Spock's tactics to "cowboy diplomacy," an emotional comparison never made of any other Vulcan. When you think about his unique biology, bicultural youth, and supportive parents, it's easy to see how Future Spock came to be. What does this mean for the Spock of the present, the one who’s struggling so deeply with his emotions? Individuals experiencing PTSD can go down many different paths. While Zachary Quinto's Spock will never turn out exactly like Leonard Nimoy's (one experienced significant trauma, the other didn’t), Present Spock can learn to overcome his trauma and grow from the experience. Post-traumatic growth is the positive change that happens to a person as a result of their struggle with a trauma. Trauma doesn't cause a person to grow, it's about the decisions a person makes as a result of their trauma. Many people who experience post-traumatic growth describe feeling changed by their traumatic experiences, feel more connected to others, become more resilient against crises, or have a greater appreciation for life (think Captain Picard in “Tapestry”). Growth doesn't mean people don't suffer; pain is a part of the process. Growth cannot happen until you to learn how to face difficult emotions and talk about the things going on in your head. This is the challenge for Present Spock—to overcome his emotional demons. I won't give anything away, but based on what happens at the end of Star Trek Into Darkness, we're already beginning to see signs of growth in Spock (and a lot of it has to do with his friendship with Kirk—his new source of resiliency). Why is Spock such an enduring character? He is a reflection of who we are. Each of us has at one time or another felt different, strange, and out of place. As a child, Spock didn't completely fit in among Vulcans or humans. Yet he goes on to become the most influential officer in Starfleet. Growing up as a bicultural kid, I looked to Spock to give me hope that I too could overcome my “culture clash” and find confidence in myself. The current Spock honors our experience of living in a world where we are constantly exposed to traumatic events (real or televised). While I’ve been fortunate not to be immediately impacted by a terrorist attack or natural disaster, I responded to the tragic death of my brother by avoiding my feelings. Watching Spock struggle with the loss of his mother in a similar way made me feel less crazy. Spock’s future reminds us that our differences are our strengths. That’s the ultimate lesson from the psychology of Spock—if we can find a way to embrace all aspects of ourselves and approach life with an open mind, we are capable of great things. March 5th, 2015 Update: Today on THE PSYCH SHOW I remember the life of Leonard Nimoy and celebrate the psychology of Spock.